I attended the Passive House Northwest Annual conference in Portland, Oregon on March 27th and 28th. This was a great opportunity to learn more about the latest advances in healthy, comfortable and efficient Passive House Certified projects from all around the world. After the conference I toured several Passive House projects in Portland and heard first-hand from homeowners and builders from our region what was working well, and any lessons learned. I payed special attention to what they said about the heat recovery ventilators they installed and how well they were working because this is such an important component of the whole system. A constant supply of fresh air is essential for a healthy indoor environment. 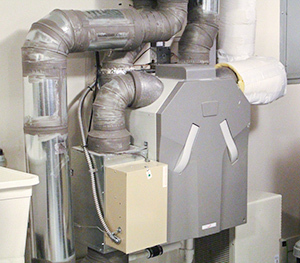 Some types of heating and cooling systems provide fresh air and other types do not. For example, radiant floor heat, while very comfortable to the feet, does not provide fresh air. Neither do the recently popular and efficient ductless mini-split systems, or less efficient but inexpensive electric radiant heat. Sometimes the code requirement for fresh air in these systems is met by installing a whole house fan. A whole-house fan is essentially an exhaust fan that runs all the time, exhausting your heated indoor air directly to the outside. This is not very efficient or effective. When air is exhausted without allowing for a way for it to come in somewhere else, it will find it’s way in from cracks and leaky places in walls, crawlspaces and attics that may be laden with mold or dust. This type of fresh air may not be so fresh after all. Most houses use forced air for heating and cooling. 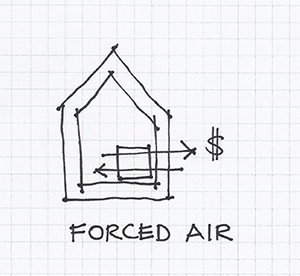 A typical forced air system brings in fresh air, but at a cost. Since forced air systems to not have heat recovery, the air you paid to heat up or cool down is just vented to the outside. No matter how efficiently you heat the air (even if with a super efficient heat pump) you are still venting it to the outside. In a heat recovery system you get continuous fresh air without losing energy. On a cold winter day for example, outside air at 32 degrees is brought into the heat recovery ventilator (HRV) with a simple fan that moves it past a heat exchanger. 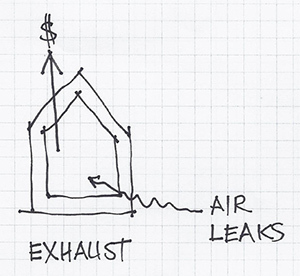 Stale air from inside the house is also brought into the HRV and moved past the heat exchanger in the opposite direction, transferring its heat to the incoming air before exiting the building. In short a heat recovery system gives you the best of both worlds; constant fresh air for a healthy indoor environment and energy efficiency that reduces the cost of heating and cooling. 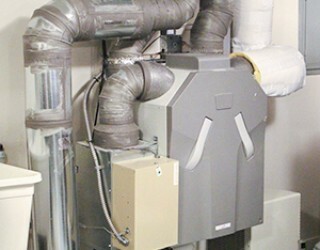 There are many types of heat recovery ventilators and energy recovery ventilators (ERVs). ERVs are typical in more humid climates than ours. Some things to consider in an HRV are ease of installation, ease of maintenance, noise level during operation, and energy efficiency. The efficiency of heat transfer has improved over the years with technical advancements and can range from 60% to 95% for different brands and models available. One of the most popular HRV units in our region is the Zehnder ComfoAir 350, which has the right capacity for fresh air for the average size home, is easy to install and maintain, is very quiet and is one of the most efficient at 95%. Installation is simple with snap together flexible ducts. All of the projects I toured in Portland this week used the Zehnder 350 and I didn’t hear any complaints from building Owners or Contractors. Here is a photo of one installed in a basement of one of the houses. The homeowners were happy with the fresh air and comfort. As for noise, even when the HRV was turned up to it’s highest setting, the sound level was very very low. Different HRVs may make sense for different projects. 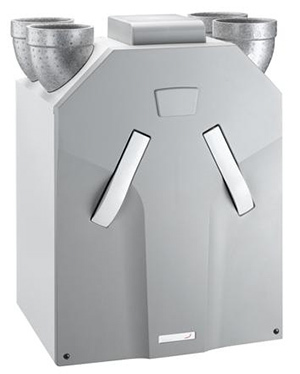 Another common type used in the U.S. is the UltimateAir RecoupAerator, which is made in the U.S. and is less expensive. 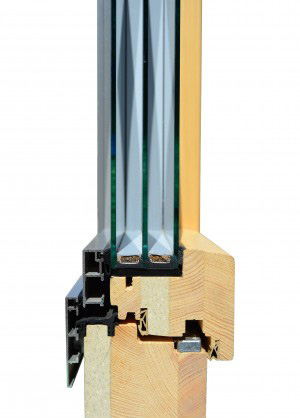 These may not be as quiet or easy to install as the Zehnder, but would still be worth considering. 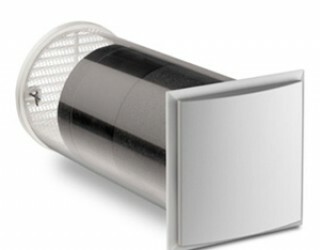 For very small projects, like an apartment or tiny house, there is a small unit made by Lunos that doesn’t need ducts. 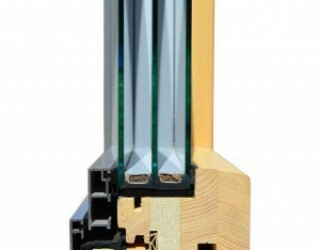 The Lunos e2 is installed by mounting it directly in an exterior wall. 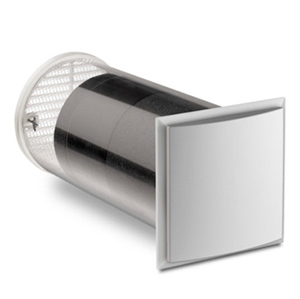 It is designed to move air in and out past a heat exchanger to provide fresh air. These are low capacity units and would be perfect for small one room project and are over 90% efficient. 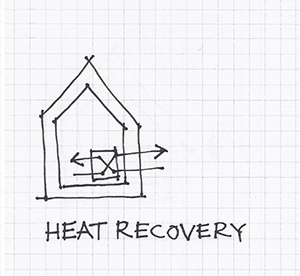 Having an air tight building and constant fresh air with heat recovery are two of the main ingredients for the qualities of health, comfort and efficiency of a Passive House Certified building. The rest of the recipe includes extra insulation, high quality windows and doors and a passive solar and shading strategy. In the next blog post I’ll look at the options for windows used in a Passive House project and why they are so important for the comfort as well as the energy efficiency. By the way, a common question about windows that also came up more than once on our tour, is whether you can open the windows in a Passive House. The answer is a resounding YES. In fact, I have yet to see a Passive House that doesn’t have operable windows.